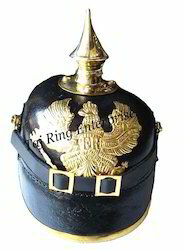 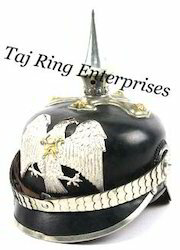 Our product range includes a wide range of leather pickelhaube helmet, eagle badge leather helmet, fr badge pickelhaube helmet, brass badge leather pickelhaube helmet, german pickelhaube helmet and german officer helmet. 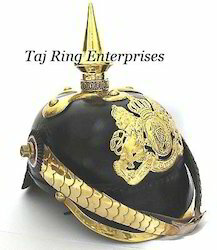 High quality of durability and eye catching design. 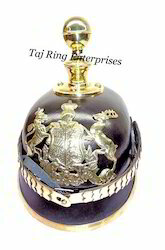 Adjustable Inner leather lining for comfort wearing and perfectly hand Assembled.Made of Leather with Brass Badge, Spike and Chin ScaleCrafted from high quality of leather and brass fittings. 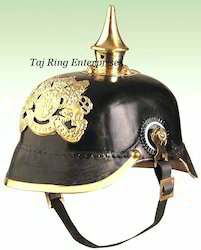 Collectible Leather Officer Pickelhaube Helmet and reproduction of German officer helmet.Adjustable Inner leather lining for comfort wearing and perfectly hand Assembled.High quality of durability and eye catching design. 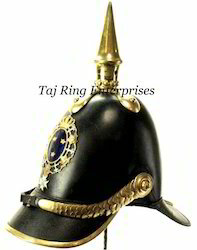 Prussian Pickelhaube WWI/WWII Spiked Movie Prop Fancy Dress Helmet Made of Real leather with brass trim & fittings, metal side rosettes, leather liner All fittings made from : fine quality brass comes with pre-fitted Adjustable Leather Inner.FR BADGE Helmet with Chain Scale..
with pre-fitted Adjustable Leather Inner. 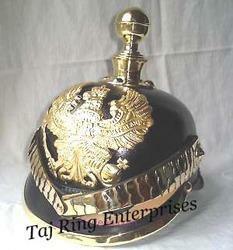 Spike and Chin ScaleCrafted from high quality of leather and brass fittings.